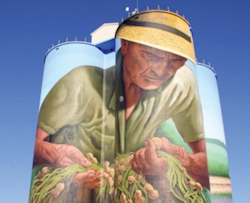 This 100 ft operational peanut silo is painted by muralist Charlie Johnston of Winnipeg, Canada. This giant mural depicts a South Georgia farmer pulling up his peanuts to inspect his crop and decide if it is time to harvest. This enormous mural wraps around all four sides of the silo with agricultural images of cotton, corn and peanuts just to name a few. Colquitt has 13 murals based on stories that have been gathered for the town production of "Swamp Gravy." The muralists, folk artists to realists, hail from all over the country. 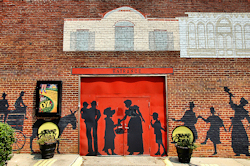 Take a stroll through Colquitt, and see how our murals "have a story to tell." 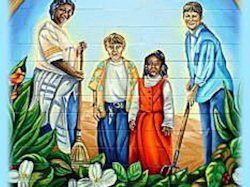 Located throughout Colquitt and Miller County, the murals are based on stories from the community. 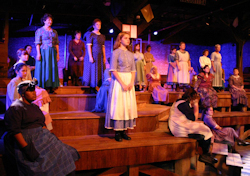 Originally a cotton warehouse, Cotton Hall Theater is now home to all of the productions put on by the Colquitt/Miller Arts Council, including Swap Gravy. The box office and Storytelling Museum are open during regular weekday business hours, Mon-Fri, as well as during productions in Cotton Hall. Call ahead, and one of our staff would be happy to schedule you for a guided walking tour of the murals in our Millennium Mural Project, including the Agricultural Icon Mural, a 400-square-foot tribute to the farming industry. Georgia's Official Folk-Life Play- Year after year, Swamp Gravy produces plays that delight audiences of all ages and all backgrounds. While definitely steeped in Southern tradition, Swamp Gravy presents stories of universal appeal- stories about life and death, about family, about community.